It was a freshmen showcase again for the Blue Devils as Duke’s impressive youngsters combined for 75 of Duke’s 94 points. Army fought valiantly and stubbornly, giving Duke more of a struggle than Kentucky did last week, so kudos to them for that. 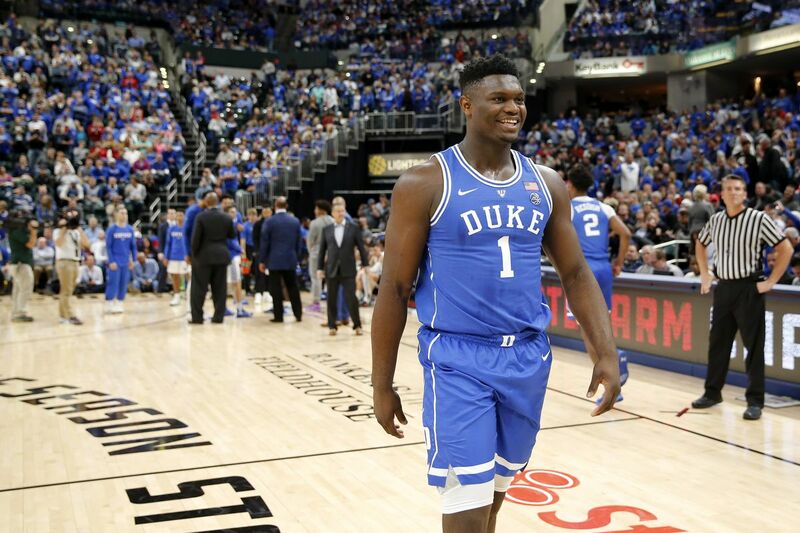 Zion Williamson continued to provide material for a SportsCenter Top 10 show of his own and putting up video game numbers, while Cam Reddish flexed his shooting ability with 7 3s. Keep sleeping on him, I dare you. Don’t forget RJ! RJ put up 23 points to go with his 6 rebounds and 2 assists. It was a quiet day on the stat sheet for Duke’s older guys, but Jack White posted 6 points and 4 rebounds. There were a few mistakes along the way but again, it’s the second game with a team whose stars are entirely comprised of freshmen, so it’s really nothing to look into. Joey Baker did not play again, which definitely continues to support the notion that he will redshirt this year. Redshirting is probably a good choice for him as he can get practice in against stars like the guys on this team and still save a year. If you remember, he reclassified a year and should be a senior in high school right now, so having that experience under your belt despite being about the age of the incoming class would give him an advantage, were he to elect to do so. Bleed blue. Next up, Duke will face Eastern Michigan for one last home appearance before heading off to Maui for the Maui Invitational. It was an epic night as we got a glimpse of our team in a real scrimmage for the first time since August. The hype video got the night started, then the players took the floor for the first time in uniform, and the Blue-White Scrimmage began. First of all, the Intro Video is fire. Literally. It’s also got an interview (Tre Jones and Javin DeLaurier), and apparently, Javin yelled “Chicken” when he made a three-point shot. Find out what that was all about above. The countdown to Countdown is over, but the Countdown to the Classic is ON! The Champions’ Classic is on November 6th at 9:30pm vs. Kentucky. Bleed blue. Image featured on homepage is property of Duke Athletics. I do not own that photograph. Capping off their unbeaten Canadian tour, the Blue Devils won in a beating of the McGill Redman, but the score doesn’t tell the whole story. McGill played a very impressive first half, despite Duke’s offensive dominance. They trailed only by one at the start of the second quarter, after leading for most of the first. Kudos to them for a game well played. It may not look it, but they fought valiantly and didn’t truly give up until the final horn sounded. Zion Williamson (1) and Marques Bolden (20) go in for the double block on an unidentified McGill player. Copyright © Duke Athletics. Guys across the board performed well. Take Jordan Goldwire, for instance. Despite a few instances where he tried for spectacularity instead of simplicity, he passed the ball well and had a good shooting night. Javin DeLaurier defended very well, as per usual. His role for the group is increasing by the minute played. Antonio Vrankovic defended and scored well in the post, using his size and skill to lead down low and has shown incredible growth. Justin Robinson got lots of playing time, which will help his role continue to expand. Jack White made some huge leaps (literally, his rebounds were way up in the air) and played the ball well. There was also an all-around intensity: guys were diving for loose balls, getting tough rebounds, doing the dirty work that makes everything look good. Marques is also my prediction for a breakout player. He’s been hobbled by injuries, but this year he’s in position to dominate in the starting lineup. Then you’ve got the incredible, incredible freshmen. It was the Zion Williamson show today, as he had 36 points and 14 rebounds even though he sat with about eight minutes remaining (I think). RJ and Zion put on a show in Canada and we’re hoping it continues in November. Bleed blue. After getting a taste of this year’s star power, we have to wait until OCTOBER? How cruel. After starting out down two guys at guard (Cam Reddish and Tre Jones), Duke’s depth started to slip. Now, it’s gotten worse. With sophomore guard Alex O’Connell out the rest of the tournament with an orbital bone fracture, there are almost no guards left on the squad. Jordan Goldwire, Mike Buckmire, and Brennan Besser are the only three left. Of course, all three players should be healed by the time the regular season begins. However, with smaller guys dominating the Toronto lineup, some of the bigger guys will have to play like a guard. Of course, there’s Zion Williamson, who is “a powerful Mack Truck with the feet of a ballerina” (Jay Bilas). He has the ability to keep up with a guard, and Duke has centers in Marques Bolden and Antonio Vrankovic. It’ll work out. Canadian collegiate basketball is not something I’ve studied, but Ryerson is reportedly the best team we will face this week. Jordan Goldwire stood up to run the offense on Wednesday. Will he step up again? Who gets a boost in playing time? Against Ryerson, lots of minutes were given to Javin DeLaurier, Marques Bolden, Goldwire, Justin Robinson, and Jack White, and of course the two freshmen after O’Connell’s early injury. This game will be the last of the two games played in Missassagua, R.J. Barrett’s hometown before the Blue Devils travel to Montreal for McGill. Duke is favored pretty heavily despite the absences. Obviously, the athletic advantage is there, but Toronto has a heavy advantage by means of experience. These guys are smaller, agile, and good shooters. It’ll be a challenge, but beating a team like Duke is a monumental order. It’ll be a good test for Duke, who will face more experienced teams all season long, especially in the grueling ACC.